Well it certainly felt more like summer this week. It was a busy week here on the farm as Farmer Figgins and Ol' Man Fahler (Farmer Don's Dad) frantically finished up some projects around the farm before they left for the summer. They did get a lot done, getting the Hugelkultur raised beds unearthed from the weeds, and getting the rest of the garden weeds fought back. They also found time to build a few lean-to wood shelter off our small shed we use to start chicks in. The Green Beans are coming in fast and strong! Sara picked 35lbs in one day this week! We've started some freezing for winter, and will have extra available starting next week, week 7. We again have a new vegetable added to the shares this week the Lemon Cucumber! Unfortunately we are on a short lettuce hiatus, as we wait for the next planting to catch up. 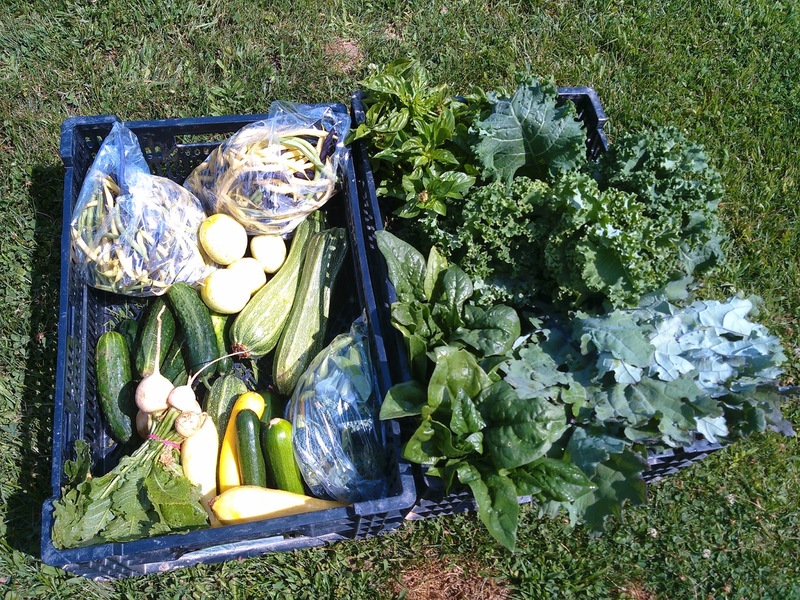 IF YOU WOULD LIKE EXTRA WE WILL HAVE A LIMITED AMOUNT FOR SALE AT DROP OFF OR AT THE FARM OF: BEANS, SQUASH, KOHLRABI, CUCUMBERS, AND LETTUCE MIXES. New This Week! This is probably Farmer Figgins favorite specialty crop we grow. This is an Heirloom variety of cucumber that doesn't grow large green fruits. Instead these small apple sized cucumbers have a bright yellow skin. They make a fantastic snack with no clean up because the entire thing is edible and delicious. They can also be used to make your favorite cucumber salad recipe. These were a new vegetable to many last year, and hopefully our new shareholders will enjoy them as much as everyone did last year. New This Week! We haven't quite got the hang of snap peas and never seem to get enough. We do have a small amount of snap peas in all the shares this week. Enjoy them fresh as a snack. We have lots more of the Green Beans and the second planting is just starting to flower. This will be the first crop that is really great for storing, and that we will have large quantities available of so get your freezer bags or pressure canners ready! We are growing a mix of varieties this year so you will be seeing a mix of Green, Purple, and Yellow Green Beans throughout the season. This summertime favorite is loved by almost everyone. Raw they are very tasty but there are all sorts of ways to prepare this veggie. Last night we fried them up in a little butter with pepper and garlic. Steam them, bake them, bread and fry them. You can also pickle these along with a few cucumbers! The last of the turnips for a while, and will only be in Full Shares this week. These turnips are great raw – sweet and mild, or cooked lightly in stir-fries and soups. They are not spicy and bitter like the standard purple top turnips. In fact, Kids love Hakurei Turnips raw on a salad plate! The greens are also very much edible, just wash, chop and steam or stir fry. In Japan they are often pickled, you can make a quick pickle by adding a teaspoon of vinegar (rice or white wine) and several pinches of salt to a bowl of sliced turnips. Another summer favorite that is easy to use in a lot of different recipes. We will have a mix of Zucchini,an heirloom variety, costata romanesco zucchini and Yellow Crook Neck squash for everyone this week. These are starting to get large enough for making zucchini bread one of Farmer Figgins favorite way to use squash! More Broccoli this week. This veggie can be used so many ways it almost seems silly to try and give suggestions for use. You can eat it raw in a salad, put it in a quiche, cook it in a stir-fry, throw it in a soup, steam it and have it as a side to any meal. Let us know your favorite way to eat this super nutritious green! We've got bunches of Genovese Basil, and lemon basil this week, enjoy!